WaPo: "The Thin Red Line" is the thinking person's "Saving Private Ryan." Writ with a little less blood and a lot more poetry (both the visual and the literary variety), Terrence Malick's symphonic adaptation of James Jones's novel about the World War II battle of Guadalcanal harrows the psyche with its rake-like teeth even as its beauty intoxicates the eye. Some may rightfully complain that its plot leaves the very issues it raises (life, death, immortality, madness) unresolved, yet the disturbing ideas it plants in the soil of the soul need time and darkness – not light – to germinate. Roger Ebert: Terrence Malick is the director of two of the best films I have ever seen, "Badlands" (1973) and "Days of Heaven" (1978). 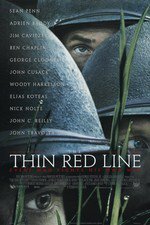 "The Thin Red Line" feels like an extension of the second film, in which a narrator muses on the underlying tragedy that is sometimes shown on the screen, sometimes implied. Both films are founded on a transcendental sense that all natural things share their underlying reality in the mind of God. The film opens with a question: "Why does nature contend with itself?" It shows a crocodile, a killing machine. Later, as men prove more deadly than crocodiles, it shows a bird, its wing shattered by gunfire, pulling itself along the ground. In a way the film is not about war at all, but simply about the way in which all living beings are founded on the necessity of killing one another (and eating each other, either literally or figuratively). NYTimes: "The Thin Red Line" will as easily fascinate those attuned to Malick's artistry as it disappoints anyone in search of a plot. For all the marquee power of its stellar cast and the story's potential for high drama, remarkably little happens. As in "Saving Private Ryan," violence erupts with shocking randomness for soldiers at the battle site, but it is interspersed with meditative passages, glimpses of the island's indigenous life, and near-wordless passages propelled by the eloquent forboding of Hans Zimmer's score. The way light filters through the canopy of the rain forest means at least as much here as the specifics of battle. AV Club: Yet here, at least, the nearness of death forces those in its midst to turn philosophical, and the balance of magnificence and mortality gives the film its mesmerizing hold. Other war films have presented the terrors and tragedies of war just as unflinchingly. Others have found a rugged humanism among those tragedies. But Malick goes further, trying to puzzle out what about war makes us human, and willingly accepting whatever wonders and awful truths present themselves as answers. Rolling Stone: The thing to know upfront about The Thin Red Line, aside from its status as a flawed but stunning achievement, is that it doesn't open with a bang. Where Spielberg thunders, Malick insinuates. In Ryan, soldiers land on Omaha Beach to face German mortar fire that results in gushing arteries and severed limbs. In Line, an army rifle company — C, for Charlie — hits the beach at Guadalcanal expecting mass slaughter, only to find no initial resistance from the Japanese. Yet the scene is all the more terrifying coming after so much anxious waiting. Malick also shows the devastating effect of American and Japanese invaders on this serene island, from its Melanesian inhabitants to the shelling that reduces vegetation and wildlife to dead ash. This may be an excellent Terrence Malick movie, but it is a terrible movie in every other respect. I hated hated hated it. I left the theatre thoroughly disappointed, and nobody I was with had the least positive comment to make in its favour. OK, yes, it was beautiful, and you knew it was made by someone with great movie talent, but it was so damned dull, pointless, and endless. I so wanted to like this, but I just couldn't. I'm convinced Malick lied to all the actors, telling them different things about the movie. "Caviezel, you're in an art film. Nolte, you're in a war movie. Cusack, a coming of age film. Harrelson! Buddy! Pal! You're in a comedy." I would LOVE IT if that was the case! I loved this film when I saw it in the theater (my friend who was with me hated it), but haven't really felt the need to watch it since. I loved that it was much more an experience than a narrative, I loved how slow and atmospheric it was, much more a slice of a piece of someone's life than your average movie. And it's so, so beautiful. I've always held the opinion that Malick's movies are visual poems. The narrative is driven by the viewer's own thoughts rather than any real plot. The statement above about it being a bad movie isn't wrong but for me I don’t re-watch it every few years to see a "good movie." I watch it for my own reactions, how I've changed, how my worldview is now, how the images and words make me feel now. A reflective experience. An incredibly personal experience. Saving Private Ryan came out the same year and of course won all the awards. Movies are entertainment, even war movies, even movies where Tom Hanks dies. Thrilling, exciting, shocking. These things make good movies. I've seen SPR just as many times as TTRL but for completely different reasons. It's hard to tell people to watch TTRL. Like, I can't tell you it's exciting exactly, Nolte does have an amazing performance, there's fun to be had playing "spot the cameo," it's got great music, it's sort of about war, it's sort of about the joy and sadness of life, there's a really sad love story, there's an examination of PTSD, there's cynicism and optimism, there are beautiful images. But no, it's not a good movie. I wonder how people would feel about this movie if it either (a) had fewer of the noticeable actors and/or (b) had a more traditional narrative structure. My own sense is that it defies people's expectations in a way that they can't help but be disappointed--it makes it so much easier to focus on what the film is not than on what the film is. It probably didn't help that it came out contemporaneously with Private Ryan which hews so closely to convention. When you see a big-budget, gorgeously shot and scored film with a three hour running length, a cast of a dozen well known actors (less of whom were as well known at the time of its release, but still) that depicts a brutal and historically significant epic battle in relatively recent American history, you expect something much more along the lines of Private Ryan than, I don't know, Solaris or a Bergman film, or something. I don't think it's particularly odd in any way that people didn't enjoy this film--nearly three hours of only loosely interconnected meditations on life in the midst of war doesn't provide nearly the same type of viewing experience and satisfaction of films like Private Ryan, or even of less sprawling Malick films, like Days of Heaven--also beautiful, but just about half as long. But I really can't get behind the idea that the film is "bad" in some quantifiable way. I'd argue that the case that the film is objectively brilliant is stronger than the case for it being bad; but I'd not quibble with anyone who told me they didn't like the film. I still often think about the scene where the line of soldiers passes a few of the native islanders -- the soldiers on their way to a battle, the islanders returning from a hunt, or simply on a hike. It's the thesis of the film, and a great example of film semiotics -- it's a bit obvious, sure, but Malick doesn't hold it for too long (if I remember correctly). He's very good at visual storytelling. I should see this again. I feel like I spent most of 2001-2002 watching this and Requiem for a Dream over and over. It was a great comfort for me at that time. My favourite (see: only) Malick and probably my favourite WW2 film. I've always held the opinion that Malick's movies are visual poems. I wonder how people would feel about this movie if it either (a) had fewer of the noticeable actors and/or (b) had a more traditional narrative structure. This is why good editors are worth it. Malick obviously garnered a free hand. But someone needed to pull back on the excesses. Does Sean Penn and all of his scenes need to be in the movie at all? What is that adding to the Caviezel arc? Do Clooney and Travolta being, you know, Clooney and Travolta, add to our understanding of Caviezel? Of Nolte? Someone should have asked Malick these questions in pre- and post-production. These questions probably were asked, actually. But oh well! I liked it when I saw it. I need to see it again. I actually watched this movie because I got into Explosion in the Sky's music and listened to this song which has one of the monologues in it. Or at least I think that's how it happened. I loved it but I would never blame anyone for disliking it. Hans Zimmer did the score for this film and it's easily the thing I love most about the film. It even managed to momentarily get me excited for Bay's Pearl Harbor when they used one of its songs in the initial trailer for that film. One can close their eyes and simply listen and the music will evoke the story that the film arguably succeeds or doesn't succeed in telling. What I like for a lot of the film is that the Japanese soldiers are almost non-existent. They're an unknown fear abiding its time in the tall grasses and in the hills, simply waiting for the Americans to try and assault them. The bunkers are almost simply bursts of bright machine gun fire and little more. Death is hidden and invisible in this movie and its the internal struggle of the various men which becomes the battleground. In preparation for the movie, I read the novel, and found the adaptation by Mallick to definitely pursue an all together different purpose. I've unfortunately forgotten much of the book, but the perspectives are different. One is really based from the individual soldier's experiences and the other is a much wider vision encompassing the views of multiple characters from private to colonel. One scene from the book, which stands out to me, involves a soldier being pushed by the signal corps (or was it just the PR guy for the colonel?) into handing over a beautiful bejewled katana he had captured in a village entirely because it would be a great photo op. I don't think that made it into the movie. But, the differences between the book and the film also kind of reflect the differences between it and Saving Private Ryan. One is a meditation on war, what war is, does, and so on, while the other is somewhat about the terrible nature of war, but that terrible nature is also, intentionally or not, wrapped around the idea of heroic sacrifice for another. Our horror at the war in Europe is diminished by our admiration for the rangers hiking and fighting their way through France in search for the titular Private Ryan. The Germans are the antagonist in that film, whereas war itself is the antagonist in The Thin Red Line. One of the first scenes in the film is very blunt about the intrusion of war into our world. Cavaziel and his buddy are living with a local village of islanders, who sing beautifully, are beautiful happy people living in a paradise of blue seas, white sands, and green palms. It concludes abruptly when a naval ship intrudes, slicing its way through the turquoise waters, introducing war into the Eden.